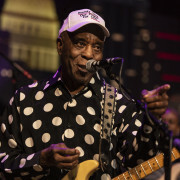 Austin City Limits presents a thrilling hour of blues and hip-hop in a new installment featuring legendary bluesman Buddy Guy and August Greene, the all-star collaboration featuring Grammy-, Emmy- and Oscar-winning Common, and renowned modern jazz greats Robert Glasper and Karriem Riggins. 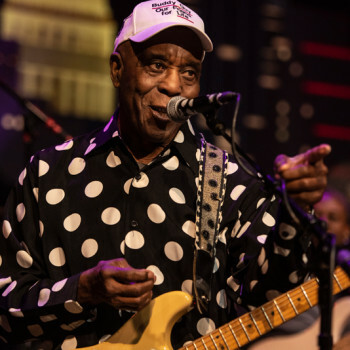 Blues-great Buddy Guy throws down in an entertaining performance of classics and new songs from his Grammy-nominated album The Blues Is Alive and Well. The living legend has played and sang the blues for over half a century, and he proudly flaunts his fretboard expertise and bottomless catalog during his fifth ACL appearance. Guy and his four-piece Damn Right Blues Band take the stage appropriately with the classic “Damn Right I’ve Got the Blues.” Working without a set list, Guy pays tribute to fellow Chicago bluesmen on the Junior Wells classic “Hoodoo Man Blues” and Sonny Boy Williamson’s “Nine Below Zero” then revisits his Grammy-winning 2015 album Born to Play Guitar for the blistering title track. He thrills the ACL audience with the roof-raising “Slippin’ In,” from his Grammy-winning 1994 album of the same name and takes a string-bending, guitar-solo-ing stroll through the captivated crowd as living proof that the blues is, indeed, alive and well. The dynamic hip-hop collective known as August Greene take us for a beautiful ride, performing numbers from their acclaimed self-titled debut. 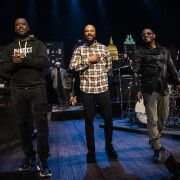 This supergroup, featuring veteran rapper Common, four-time Grammy-winning keyboardist/producer Robert Glasper and celebrated jazz drummer/producer Karriem Riggins, lay down a sublime groove overlaid by Common’s socially conscious and empowering narrative. Joined by four backing musicians, the group opens with its hit “Black Kennedy,” a hard look at post-Obama America, deftly adding the chorus of Bon Jovi’s “Livin’ On A Prayer” to this celebration of black excellence. 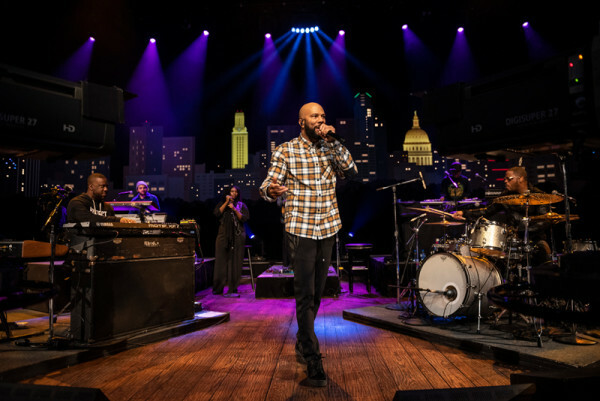 Backing vocalist Samora Pinderhughes delivers a spellbinding hook, joining Common at center stage for the urgent “Let Go,” as the rapper encourages the crowd to release any negative energy. The group segues directly into the buoyant “Geto Heaven,” from Common’s 2000 breakthrough classic Like Water For Chocolate, honoring many of the fallen from the civil rights era along with the black victims of contemporary gun violence. “I feel like you all let go right there,” smiles a beaming Common as he champions the excellence of all the musicians onstage and the set closes with dazzling solos from Riggins and Glasper. Tune in this weekend for this episode, and, as always, check your local PBS listings for the broadcast time in your area. Go to the episode page for more info, and don’t forget to click over to our Facebook, Twitter and newsletter pages for more ACL info. Join us next week for another brand new episode, featuring the Americana Music Festival’s seventeenth annual honors and awards program.